The new portrayal appears designed to build domestic support by delivering on promises to develop the economy alongside the nuclear programme and to reassure citizens amid tightening international sanctions. Seoul: After a summer filled with flaming rockets and an earth-shaking nuclear blast, North Korea's state media is portraying Kim Jong Un as a leader who has temporarily traded weapons for workshops. 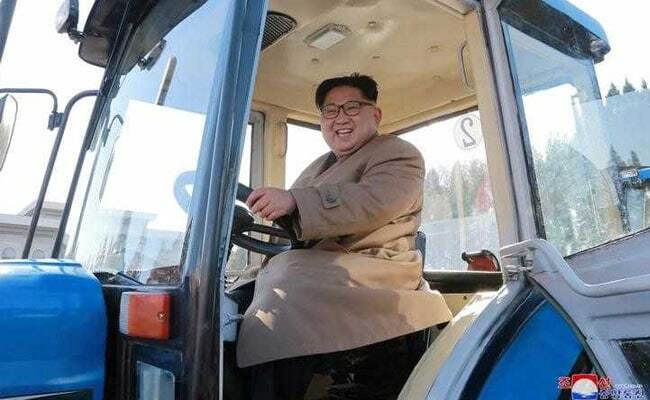 State media photos released on Wednesday showed Kim examining equipment at a tractor factory, test driving one of the vehicles and laughing with workers, the latest in a stream of photos in the past two months depicting a smiling Kim visiting farms and factories that make shoes, cosmetics, trucks. Between June 21 and Sept. 20, Kim did not conduct a single public activity related to the economy, instead focusing almost exclusively on appearances at events including missile tests or tours of weapons factories, according to data collected by South Korea's Ministry of Unification. The resumption of public, economic-related activities has coincided with a lull in missile testing. North Korea has not fired a rocket or tested a nuclear weapon since it launched a ballistic missile over Japan on Sept. 15. The break in testing matches lulls at similar times in past years and North Korea is almost certainly continuing its push for more capable nuclear weapons, South Korean officials say. But the renewed focus on economic development could be a bid to unify North Koreans and strengthen support for the leadership, said Baik Tae-hyun, a spokesman for South Korea's Unification Ministry. "While North Korea still shows the will to continue developing its nuclear and missile programme, their focus on the economy is also helping the North Korean people come together," Baik said. North Korea may be starting to feel the pinch of sanctions, tightened after its sixth and most powerful nuclear test in September, and its leadership could be under pressure to limit their impact, said Nam Sung-wook, a professor of North Korean studies at Korea University in Seoul. "Kim Jong Un has been simply doing what he does best - encouraging his people to achieve rapid economic growth and boost production," Nam said. "Taking care of the economy and his people are the top priorities." Since taking the reins of the reclusive regime after the death of his father at the end of 2011, Kim has embraced a goal of simultaneously pursing economic development and advanced nuclear weapons. New U.N. Security Council sanctions in August and September banned imports of coal, textiles and seafood, while restricting oil shipments to the North. North Korean officials have said in state media the sanctions were causing a "colossal amount of damage" to ordinary North Koreans, while leaders have shown defiance, arguing that self-reliance can overcome international pressure. "The main key to foiling the extremely vicious sanctions and pressure of the U.S. imperialists and their vassal forces and turning misfortune into a blessing is just self-reliance and the sci-tech strength," Kim said in an Oct. 7 speech to leaders of his ruling Workers' Party of Korea, according to state media. Benjamin Katzeff Silberstein, a researcher with the Foreign Policy Research Institute who tracks North Korea's economy, said there was a push to expand manufacturing and decrease reliance on imports of a wide range of goods. North Korea was also looking to expand exports of products not covered by sanctions, such as tractors, Silberstein added. While analysts say there is anecdotal evidence the sanctions are beginning to the North's economy, it is not clear to what degree. Prices of petrol and diesel have spiked, but the cost of foods likes corn and rice have remained relatively stable, according to a Reuters analysis of market data collected by the defector-run Daily NK website.